Life, liberty, and the pursuit of happiness are commonly known as the American Way. I would add a latte made with coconut milk and the high risk for fatigue and burnout to that list. American’s, while not excluding other nations, tend to be overworked, overcommitted, overweight, overwhelmed and just plain tired. They are on the fringes of diseases of the mind and the body and their relationships are at risk of permanent damage from the overwhelm and the fallout that comes from trying to be all things to all people and do everything expected of them. Get your readers thinking about life in a new way and help them reclaim the energy that’s been lost due to fatigue and burnout with this eBook / Journal combo. This ebook would make a great info product that you can promote to your audience. It would be a perfect addition to the 30 Days of Dealing With Burnout and Fatigue we offer, but works just as well as a standalone product. Edit it slightly as needed to fit your audience and your style, and you can have a brand new eBook up and ready for sale over the course of a day or two. Or take the content and use it to create a class or coaching program on the topic. Of course you can also break the content apart and use it as you see fit. Break it down into three shorter reports to use as lead magnets, or create a long series of blog posts. No matter how you decide to use the content, your readers will appreciate these tips on avoiding burnout and fatigue. You may have heard that it takes 30 days to create a habit and with this journal you can help your readers. 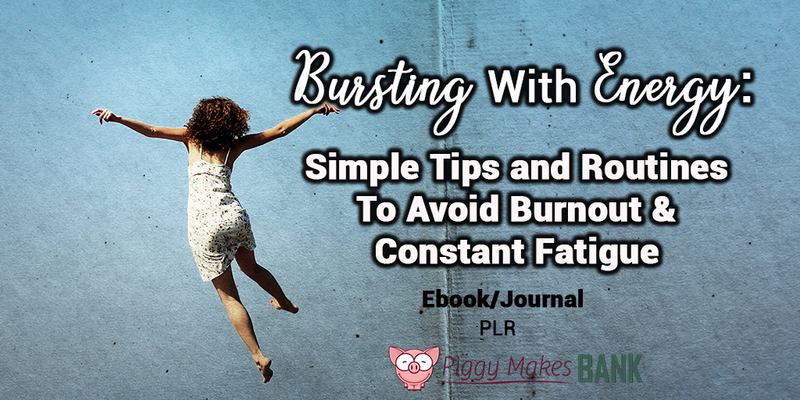 There are 30 pages that will help record thoughts and progress as your audience begins their journey to stop burnout and fatigue from taking over their lives. The journal includes inspirational quotes, and of course plenty of space for them to record their thoughts and feelings. Readers can print out a fresh copy or each month and continue to use the journal for as long as they need it. If you want to help your readers learn how to have more energy, you can get this incredibly value-packed bundle for only $47. That’s way less than you’d pay a quality ghostwriter to write just a couple of articles for you. That's an ebook and journal for just $47. Give your readers the content they are looking for.